The kind of Urgent Care Manhattan Beach would like to have is something that may seem like it's no longer available - and that's doctors making house calls. After all, it's much more convenient for the doctor to come to you than the other way around, but what some may not know is that they can still get a house call doctor to see them in Manhattan Beach and beyond. Dr. Michael Farzam of House Call Doctor Los Angeles is a board-certified internist and professional in the concierge physician industry. As a 24 hour on call doctor, Dr. Farzam treats all variety of ailments from traumatic injuries to acute illnesses or flare ups of chronic diseases. Urgent care in Manhattan Beach is just a phone call away when you dial the number for House Call Doctor Los Angeles. Rather than having to venture out to the 24 hour health clinic, residents of Manhattan Beach can stay in the comfort and privacy of their own homes instead of venturing out when they feel unwell. What's more, being stuck in the waiting room can really make it a drag when you'd rather not be at the clinic for urgent care. 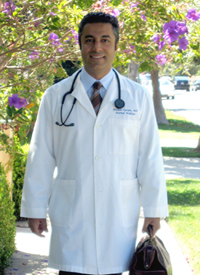 Manhattan Beach and the surrounding area can count on Dr. Farzam as their on call doctor for any number of medical predicaments, and Dr. Farzam will be sure to follow up the day after, to ensure that his patients are back to health as soon as possible. If you need urgent care in Manhattan Beach, don't settle for less, call House Call Doctor Los Angeles today at 310-849-7991!